Ordinary pizza joints are a dime a dozen. But real artisanal pizza crafters who serve fresh made-to-order pies in just minutes are rare. 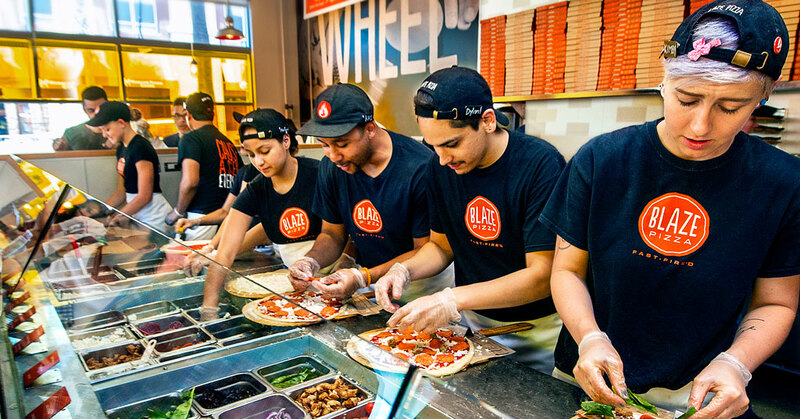 Blaze Pizza has been perfecting the craft since 2012, building a fan base of raving customers and satisfied franchisees along the way. The original Blaze Pizza restaurant opened in Irvine, Calif., and quickly gained recognition for its chef-driven recipes, thoughtful interior design, and a service culture that celebrates individuality. The brand’s “pizzasmiths” use made-from-scratch dough and proprietary recipes to cook up “fast-fire’d” thin-crust pies in their signature hot open-flame ovens. The made-to-order pizzas are ready to eat in just 180 seconds. The fast-growing chain now operates more than 300 restaurants in 42 states and five countries. The brand has even bigger growth plans and has recently revealed several new major markets where it plans to fuel expansion by partnering with top multi-unit franchisee operators in Dallas, Cleveland, Houston, San Francisco, Philadelphia, Virginia, and Indianapolis. He opened his first Blaze Pizza in 2013 and says the brand has supported him all along the way as he has grown. He says the brand has assisted him with real estate site selection, construction vendor selection; extensive training and support, a marketing intranet, food safety audits, and purchasing and distribution negotiation. “Blaze Pizza even trains all our general managers at their corporate stores and assists with new store openings,” he says. Stein says Blaze Pizza is “obsessed with quality” and has created an infrastructure that can support rapid growth.